The mid 15th century MS 1467 (pictured) was likely composed by a member of Clann MacMhuirich. The MacMhuirich bardic family, known in Scottish Gaelic as Clann MacMhuirich and Clann Mhuirich, was a prominent family of bards and other professionals in 15th to 18th centuries. The family was centred in the Hebrides, and claimed descent from a 13th-century Irish bard who, according to legend, was exiled to Scotland. The family was at first chiefly employed by the Lords of the Isles as poets, lawyers, and physicians. With the fall of the Lordship of the Isles in the 15th century, the family was chiefly employed by the chiefs of the MacDonalds of Clanranald. Members of the family were also recorded as musicians in the early 16th century, and as clergymen possibly as early as the early 15th century. The family claimed descent from Muireadhach Albanach Ó Dálaigh (fl.1200–1230). Muireadhach Albanach was a member of the eminent Ó Dálaigh bardic dynasty. This family is sometimes traced back to either of two men named Dálach: one is the legendary student of Abbot Colmán mac Lénéni of Cloyne; the other is another legendary figure, who was a descendant of the 8th-century Irish king Fergal mac Maíle Dúin, son of Maíle Fithraig. Muireadhach Albanach gained the nickname Albanach ("the Scot") in reference to the time he spent in Scotland. He supposedly spent 15 years in there, after being exiled for killing a steward of Domhnall Mór Ó Domhnaill (1207–1241), Lord of Tyrconell. 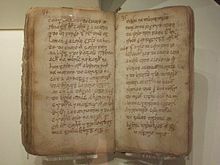 While in Scotland, Muireadhach Albanach was employed as a bard by the Earls of Lennox, and it appears as if members of his family also settled in the Lennox, as a "Kathil Macmurchy" is recorded in the Lennox in the mid 13th century. [note 1] In a lament that Muireadhach Albanach composed on the death of his wife, Maol Mheadha, he stated that she bore him 11 children. An early member of the MacMhuirich family was Lachlann Mór MacMhuirich, who authored the battle-incitement poem of Clan Donald (Clann Domhnaill) sometime before the Battle of Harlaw, which took place in 1411. A possible descendant of Lachlann's was one "Lacclannus mcmuredhaich archipoeta", who witnessed a charter of Aonghas of Islay, son of the last member of Clann Domhnaill to be recognised as Lord of the Isles. 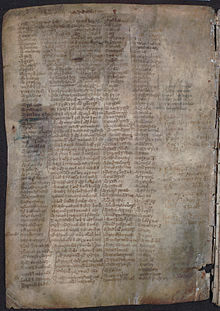 Other members of the MacMhuirich family, possibly one or two, composed poems of Aonghas's murder that are preserved in the Book of the Dean of Lismore. From about the 1490s and onwards, members of the family are also recorded as clergymen (and possibly as early as 1432, if the "John Muaritti" recorded in the Apostolic Camera is indeed a MacMhuirich). Following the collapse of the Lordship of the Isles, the MacMhuirich family appears to have been chiefly employed by the chiefs of the MacDonalds of Clanranald (Clann Raghnaill). The earliest poet of the MacMhuirich family on record is Niall Mór MacMhuirich (c.1550-c.1613). A member of the family was the seanchaidh (story-teller and genealogist) who authored much of the Books of Clanranald, which date to the 17th and early 18th centuries. One of these books, the so-called Red Book, is best known for its account of the history of Clann Domhnaill, which was composed by Niall. The other book, the so-called Black Book, is more of a miscellaneous compilation, although it contains a version of Niall's history composed by a member of the Beaton family, another learned family of professionals that was once centred in the Hebrides. Other noted members of the family were Cathal MacMhuirich (fl.1625) and Niall MacMhuirich (c.1637–1726). In the first part of the 16th century members of the family are also recorded as Harpers, and one "John oig Mc murcquhie leiche in Ilay", a physician, is recorded in 1615. The last of the family to practice Classical Gaelic poetry was Domhnall MacMhuirich, who lived on South Uist, as a tenant of Macdonald of Clanranald, in the 18th century. ^ In Scotland, the masculine Gaelic name Cathal has been confined mainly to the MacMhuirich family. Beaton medical kindred - another major learned Gaelic kindred. This page was last edited on 17 April 2017, at 12:43 (UTC).